First off. This column is three weeks late. It should have run Jan. 29. Because on that day, people like myself are celebrated. We’re not happy about it. But that’s part of the story. Jan. 29 is Curmudgeons Day. I’m a curmudgeon. I can’t deny it. I hate to think I’m getting more grumpy as I get older. It’s time to fess up to that dominant grumpy gene that makes me who I am. It’s a character trait that is self-fulling. It is time I stand up and be proud of my curmudgeonly behavior. Some people smile all the time. But not people like me. Some people are happy all the time. I’m not. Some people find a silver lining in everything. I’m kind of like that. But if I look hard enough, I know I can find something negative in every situation. 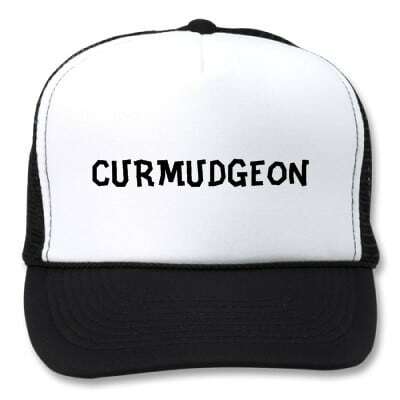 I’m slowly coming to accept the fact that I’m a curmudgeon. When talking about me, my friends don’t use the word curmudgeon, but they do love to use the word grumpy. Everyone keeps telling me to smile. His smile is the most forced thing I’ve ever seen, but it does make me laugh. So maybe I should emulate Sheldon a little more often. So what set me off on this topic today? It was simple. I received a news release that included the word cafetorium. There are some words I love. Flummox for instance. I’m the only I know who uses that word. Others are often puzzled by its meaning. I HATE that word, almost as much as I hate people who use CAPITAL letters when then write. The person who used cafetorium first should be ashamed. I’m actually thinking they should be shot, but that’s a pretty curmudgeon-like sentiment to use, even for me. I cringe each time I hear the word cafetorium. I grind my teeth each time I read it. Yes, you can use cafeterias as auditoriums, and the other way around. But don’t call them cafetoriums. So today, I blame my mood on a single word: cafetorium. I blame my attitude on my dad. Not only do I look like Richard Kent, my demeanor is starting to echo his demeanor. Well, at least half of his demeanor. My dad is a lovable curmudgeon. I’m still working on the lovable part. We had a conversation at work this week, and ironically, a similar topic appeared on Facebook on Thursday night. My curmudgeonly demeanor became evident during that conversation in the office, and the one on Facebook. I know it’s a gesture. But someone had to do it first. I don’t know who that person is, but he should be raking in billions of dollars via its use. That person invented it. Therefore, by definition — my definition — ‘the finger’ is an invention. And it’s a brilliant invention. It can mean — literally — hundreds of things. None that I can print in this newspaper. It can be used in any country, despite the language spoken there. And everyone will know what it means. It’s the essence of sign language. And I’m betting somewhere in a dark corner, someone taught that gorilla how to use ‘the finger’ effectively, although I didn’t see it displayed on that HBO special. Although I think the head ape in “Planet of the Apes” did use it effectively a few times. Anyway, the question posed on Facebook on Thursday evening was: What is the greatest invention of all time? There are a lot of good answers: the ability to communicate; computers; x-rays; airplanes. At least one person saw the merit in my answer. But to me, that obscene gesture — seen daily at four-way stops, at sporting events, at parking lot entrances — is an invention to behold. For me, “the finger” is a lifesaver. There is no better way to relieve stress. When someone pulls out of in front of me on a road, or highway, or when someone makes a snide comment about a column I’ve written, I can get mad. I can get angry. I can give myself ulcers. Instead I give them ‘the finger’ and instantly, I feel better. My blood pressure goes down. Often times, a little smile will appear on my face, too. The person on the other end of “the finger” doesn’t even have to see the gesture to make me feel better. Giving them “the finger” as they walk away from me is just as therapeutic. Giving the finger to the phone after someone complains also is therapeutic. People spend hundreds of dollars annually in an effort to lower their blood pressure. I’m still trying to convert my office workers. They’re not convinced it is as therapeutic as I am. It’s the curmudgeonly thing to do.